As the nights get darker, and the smell of chestnuts fill the air, the mulled wine flows and children start behaving ever so well... It could only mean one thing... It's nearly Christmas! All over the country, communities are gathering together for that special moment when the Christmas lights are switched on. 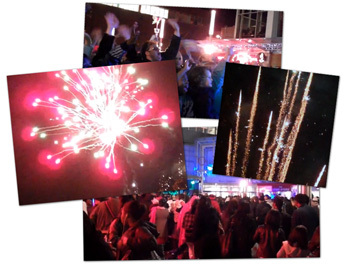 Slough, Pitshanger and Pinner to name a few have done something a little special this year and organised an extravagant fireworks display to mark the occasion! Don't worry if you missed the event, the lights are still glistening and the atmosphere is still buzzing... so what are you waiting for, go and immerse yourselves in all things merry!